Today I am rolling out some peeks from the amazing weekend I had. You see, my gorgeous niece, Ashley, did a thing. A BIG thing. She married this awesome guy, Chris, at a beautiful mountain winery near Lynchburg. (By the way, you can catch their engagement photos here.) It was fantastically fun! Annnnnd, I had the honor of photographing the wedding for them! It was SO lovely - the weather was perfect, the food was marvelous, the sunset was stunning, puppies were involved...I'm tellin' ya, it was an outstanding affair. I couldn't wait to share some images from the festivities, so without further ado...here are some highlights from Ashley and Chris's Lazy Days Winery wedding. (You might want to grab a cuppa. I went a little crazy on the sneak peeks). I loved the rustic setting at the winery, and they had a huge wedding party, which totally adds to the fun, festive atmosphere. It was one big ol' party! Aren't they gorgeous?! Gah, so happy for these two! Can you believe this crazy girl DIY'd all of the details - and almost the whole weekend! She did have help from some amazing family and friends, who pitched in to make it a perfect event. Cake smash! He went all in. We snuck away from the reception after dinner to capture this gorgeous sunset. It was such a wonderful weekend! It was an honor to be trusted with capturing their wedding memories, and one that I enjoyed immensely. 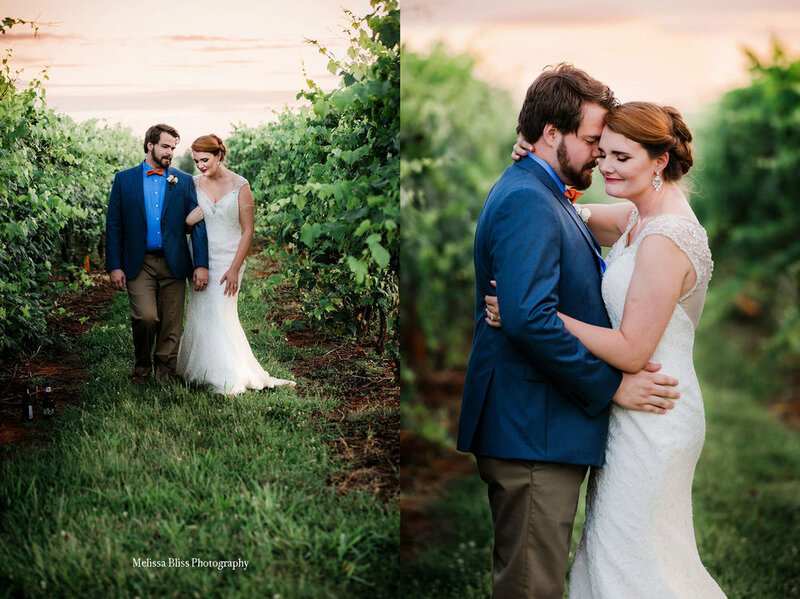 Venue: Lazy Days Winery, Amherst, VA, Day of Coordinator: Candace Kingrea, Caterer: Blue Ridge BBQ, Lynchburg, VA, Cake: Sam's Club, Cookies: Serena Beale, Florals: Sam's Club, arranged by Ashley Carasella, Hair: Ashley Carasella, MUA: Jessica Rose Makeup, Lynchburg, VA, Music: Braxton Mann & Jonathan Shirey, Invitations: Zazzle, Photography: Melissa Bliss Photography.